I love the website Moss Acres as they sell a variety of mosses instead of just lumping them all together. Unfortunately the order sizes are much too large for my usage- I wish they sold mini sampler sets or something. Like a paint chip strip but of mosses! 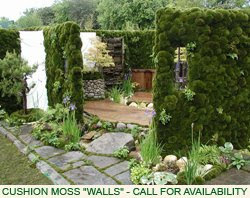 Something new they have been discussing on their site is the concept of vertical moss "walls" as well as moss roofs. I wish I lived in a climate that could handle this! How amazing. How wonderful would it be if cold corporate interiors and roofs all looked like this. 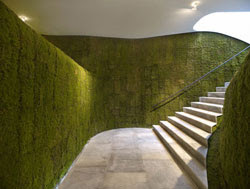 That wall is really something, but I think vertical gardening will be a big thing in years to come as space becomes ever more scarce. That is such a nice scene with the moss, looks so natural! Amazing! Thank you very much for sharing that website!